-Measured well for a modern four man at 6' 9 with a 7' 1 wingspan and an 8' 10 standing reach. Legs are twigs but his upper body has filled out really nicely. -Fluid in the open floor. Can grab a rebound and ignite the break. -Excellent instincts on the glass. Lifetime 14.5 rebounds per 40 minutes. Great timing. Crashes hard. Quick to the ball. Finished the Hoop Summit game with 10 rebounds in 19 minutes. Effective on both the offensive and defensive glass. -Playmaking forward who's best in the open floor but also capable in the half court. Lifetime 4.0 assists per 40 minutes. High risk, high reward passer. -Comfortable straight line slasher in the half court. Can attack a closeout. -Instinctual defensively. Flashes of activity on and off the ball. 2.4 steals and 1.1 blocks per 40 minutes. -Still a near non-shooter but has made a slight improvement to his shooting stroke. -Very poor lower body. Focusing too much on his upper body and negating his lower body strength. Legs are twigs. Will have to really develop his base to guard fours, where he's best suited given some of his scoring limitations. -Fluid athlete but not a freak leaper, largely due to his weak base. -Very limited perimeter shooter. Lifetime 20.9% from three (67 attempts) and 43.8% from the free throw line (249 attempts). Big hitch at the top of his release. Ball doesn't come out smoothly. Doesn't have the best feel for who he is as a player. Will hoist up contested jumpers early in the clock after making one jumper. -Sped up in closeout situations. Can be a bit wild putting it on the deck. Lack of consistency from the perimeter a primary culprit. -Struggles making shots from the perimeter really handicap him as a scorer in the half court. Defenders are able to sag off. Not a threat to pull up off the bounce. Really best as a slashing, playmaking 4 at the college level, but likely to be asked to play quite a bit of 3 at Kentucky due to their existing personnel. -Touch around the rim is quite limited. Very left handed. -Sometimes a flash over substance passer. Can be a bit turnover prone. Vanderbilt showed both his versatility and limitations all week in Portland, capped by a strong 19-point, 10-rebound, 3-assist, 2-steal, 2-block performance in 19 minutes in the Moda Center. Vanderbilt's shooting struggles still really cap his overall upside, and his lack of lower body strength ding his intrigue as a mismatch PF at the NBA level, but his rebounding instincts, flashes of defensive activity, playmaking, and straight line slashing at 6' 9 make him a very unique prospect to evaluate, especially should he figure out how to shoot. Vanderbilt's rebounding and activity will help him get on the floor early on at Kentucky, but he'll have to find some semblance of shooting and half court scoring to be considered a more serious NBA prospect. 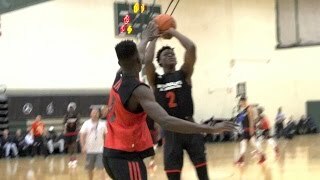 Practice highlights of elite 2017 high school prospect Jarred Vanderbilt from the 2017 McDonald's All-American Game in Chicago, Illinois. As is the case with almost every tournament or showcase he attends, Jarred Vanderbilt was easily one of the most versatile players at the 2015 Nike Global Challenge. The 6' 8 Swiss army knife out of Houston does a little of everything on both ends of the floor and finds himself around the ball on nearly every possession. Vanderbilt finished the four-game tournament averaging 18.0 points, 14.9 rebounds, 3.3 assists, 1.5 steals, and 1.2 blocks per 40 minutes pace adjusted on 46.4% from two and 25% from three. The lanky lefty is at his best crashing the defensive glass, pushing the ball in transition and making something happen. Vanderbilt has a nose for the ball on the defensive boards and shows tremendous instincts and effort in that area. Once he grabs the board he's very fluid with the ball, playing with his head up, looking for quick-hitting opportunities. While Vanderbilt can rebound, handle and pass, he does have a tendency to get very careless with the ball or try and make the homerun play (4.9 turnovers per 40 minutes pace adjusted). The vision is there but Vanderilt can improve his ability to protect the ball when on the move. In the half court, Vanderiblt does most of his damage off the ball. He's an excellent cutter and an outstanding offensive rebounder. He shows tremendous feel moving off the ball and almost always crashes the glass from the weak side. Vanderbilt can operate with the ball a little bit in the half court as he's a comfortable straight line slasher, but he doesn't have overly long strides, he isn't a threat to shoot it (either off the catch or the bounce) and has very average touch around the rim with both hands. While he's excellent off the ball, Vanderbilt doesn't offer much in terms of scoring in the half court. On the defensive side of the ball, Vanderbilt is a monster. He can guard at least three positions thanks to his size, length, lateral quickness and instincts. Vanderbilt is better defending the perimeter at this stage because of his extremely thin lower body coupled with his ability to fight over screens and contest jumpers. Overall Vanderbilt is a very unique prospect who is going to do a little bit of everything on both ends of the floor at the college level. He has some major areas of improvement to take the next step as a prospect (become a capable shooter, cut down the turnovers and finish effectively inside) but for now, it's important to appreciate the bevy of talents that the 16-year-old has to offer. Measured at 6-7 without shoes, with a 6-11 wingspan, Jarred Vanderbilt is somewhat stuck between positions at the moment, but still appears to be in an early stage of his physical development, evidenced by his lanky 192 pound frame. Vanderbilt is an impressive athlete with excellent potential defensively, even if his offensive skill-level (particularly his outside shooting) is still very much a work in progress. Considering he's only 15, that's to be expected.